Courtesy of Yva Momatuik and John Eastcott, This Marvellous Terrible Place: Images of Newfoundland and Labrador(Camden East, Ontario: Camden House Publishing, ©1988) 137. Mummering - also known as jannying, depending on what area of the island your in - is a longstanding tradition in Newfoundland. Mummering is a calendar custom that takes place around Christmas time, usually beginning on Boxing Day (or St. Stephen's Day). People dress up to conceal their identity and journey from house to house, hoping for a drop of rum and some Christmas cake. 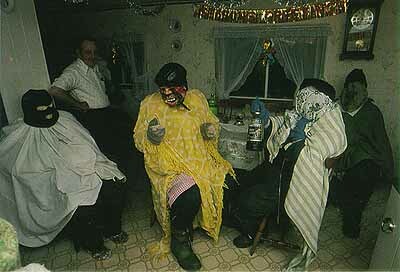 In this photo we have mummers from François South Coast of Newfoundland. Have you ever gone mummering? If you would like to know more about the controversial history of mummering, click here to listen to our podcast with Joy Fraser.